HESS-DIVO AG - Zürcich. AUKTION 306. Uklj. 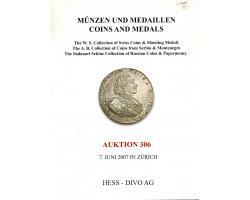 THE AB COLLECTION OF COINS FROM SERBIA and MONTENEGRO (lots 201‚-264), takođe Russian Coins and Paper Money itd. 103 str., ilus. u boji, 750 lots.